​Legs fold up for easy transportation. 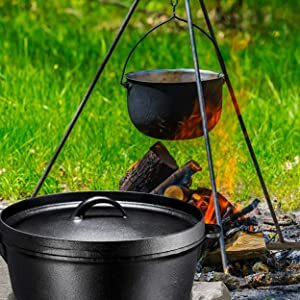 This lightweight yet heavy duty piece will add to your camping supply favorite. Weighing in at 6 pounds, the mesh offers support for multiple varieties of food. Bruntmor's portable campfire grill stand is the perfect addition to pack into the trunk of your car for your next camping trip. Use your cast iron pots and pans over this. Cozy up by the grill stand and make s'mores over the fire or cook up some freshly caught trout, you name it. Cook up hot dogs and burgers on your camp site.